Believed to have originated in South America, the North American Millipede first arrived in South Florida roughly 10 years ago. Generally, millipedes live in very damp and dark places where moisture is abundant, such as under mulch, or decaying wood. In South Florida heavy rains are all too common, which is forcing millipedes to find their way into houses and causing concern for homeowners. The moisture and humidity of our region allows the millipedes to thrive, but when their habitats are flooded from heavy rains, they tend to migrate in large numbers. Fortunately, the North American Millipede is not poisonous and they do not bite humans; other than the annoyance of their presence, they pose no real danger. They mainly eat dead and decaying plant matter, such as old leaves and flowers. You can try to prevent millipedes from entering your home by cleaning up any leaves on the outside of your house or seal any openings around the foundation. Unfortunately, these tactics do not always work 100% of the time. If the problem persists, call the professionals at Beach Environmental Pest Control. Our team can help keep your home millipede free. 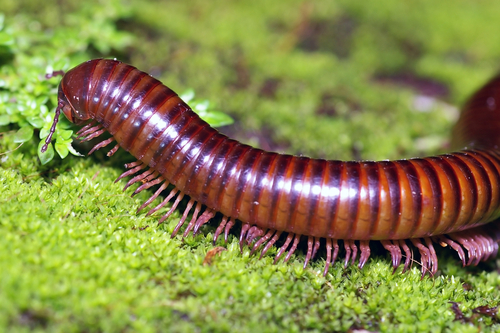 Beach Environmental’s technicians are highly trained and specialize in treating South Florida Pests, including the mighty millipede. Our experts will identify the origin of the millipede migration, and with the use of our environmentally safe products, we will make sure that the millipedes stay out of your home.